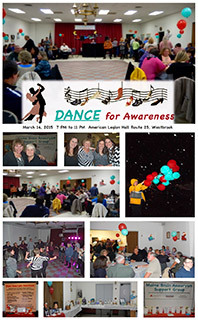 On March 14, 2015, over 150 people braved the rain & snow, put on their dancing shoes, and joined us for our 3rd annual “Dance for Brain Aneurysm Awareness". All enjoyed an evening of socializing and dancing to the music presented by DJ Scott Ward. Survivors and families having suffered losses to Brain Aneurysms were honored and remembered along with observing the March birthdays of our two girls lost to ruptured Brain Aneurysms – Kim Tudor and Karo Kurka. A fantastic Silent Auction, Gift Item Auction and 50/50 raffle were all well received with over $3,000 raised to benefit Brain Aneurysm Awareness. We extend our heartfelt appreciation to all the wonderful sponsors and committee members that donated items to the auctions. We also thank the committee for their continued hard work in organizing these important events. The final dance song title says it all – “WE ARE FAMILY”! Thank you for making the “Dance for Awareness” a great success and we look forward to more folks joining our efforts in Maine to increase Brain Aneurysm Awareness and Research.